Here in Surf City USA, surfing extends far beyond the average “hang ten.” Every year, salty dogs join the ocean action in Surf City Surf Dog (SCSD) at Huntington Dog Beach, a surfing competition that sees furry shredders competing for annual barking rights. This year, the 9th Annual McKenna Subaru SCSD kicks off on Friday, September 22, as the second event of Surf Dog Events’ two-part series. Here’s all you need to know about all the upcoming doggone fun, and we even sat down with the first event victor to find out how our famed Surf Dog Joey is preparing for round two. A three-day celebration, SCSD begins on Friday with a Pooch Party and Fashion Show at Bella Terra. The free event runs from 6-8 p.m.
Saturday, September 23, marks the main event—the dog surfing competition—from 8 a.m.-2:30 p.m. at Huntington Dog Beach, located at Goldenwest Street and Pacific Coast Highway, or 100 Goldenwest Street. As more than 70 “pawticipants” and international “surfurs” hit the waves in shredder/pro, tandem, and stand up paddle (SUP) heats, as well as four weight-class divisions, a panel of professional surf judges will rank competitors on a variety of skills, including ride length and difficulty of wave and maneuvers. The event is free and open to the public; organizers simply ask that spectators donate to one of the event’s official charity partners by texting 858-314-DOGS. RSVP via Facebook. Not only will spectators have the opportunity to watch some of the world’s best surfing pups, they’ll also be connected with the event’s official charity partners via the “surfur” expo, including Barks of Love, Huntington Dog Beach, French Bulldog Rescue Network, Orange County SPCA, Southern California Golden Retriever Rescue, and Westie Rescue of Orange County & Beyond. Metered parking is available at two Huntington Dog Beach parking lots between Goldenwest and Seapoint streets, and along PCH. 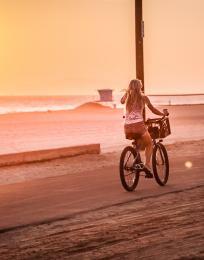 Free non-metered parking can be found in the surrounding neighborhood along PCH. The first Surf Dog Event took over Imperial Beach in July, where Huntington Beach’s own Surf Dog Joey clinched the gold in the small dog category. 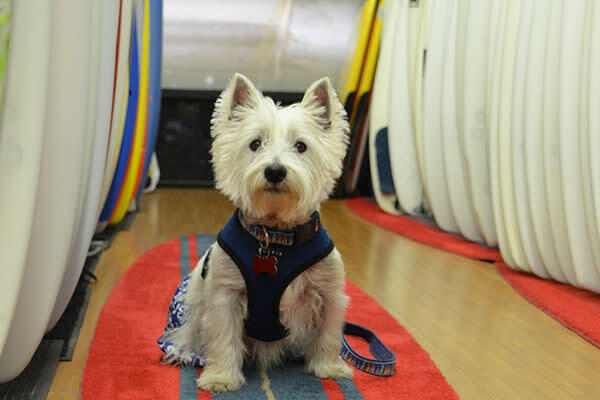 We caught up the nine-time surfing competitor, four-time award-winner, and Westie Rescue of Orange County & Beyond (WROC) spokesdog—and his owner Kay DeLoach—for a special glimpse into the life of a four-legged surfing champion. 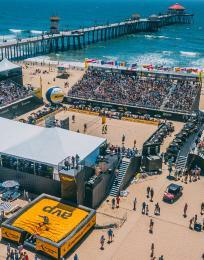 1) Visit Huntington Beach: How did it feel to win Imperial Beach Surf Dog on July 29? Surf Dog Joey: It felt great to win, but truth be told, I surf for the fun of it, the exhilaration of the ocean spray in my face and surfing all the way to shore, and spending quality time with my family. 2) How has your life changed since being crowned the 2017 Imperial Beach Surf Dog? For the first few days after the competition, I got lots of attention. Roasted chicken, full-body dog massages, fancy hotels, limousine rides, and the like. But it was short-lived, and now I’m back to my regular job as WROC’s spokesdog and representative of all rescue dogs in need. 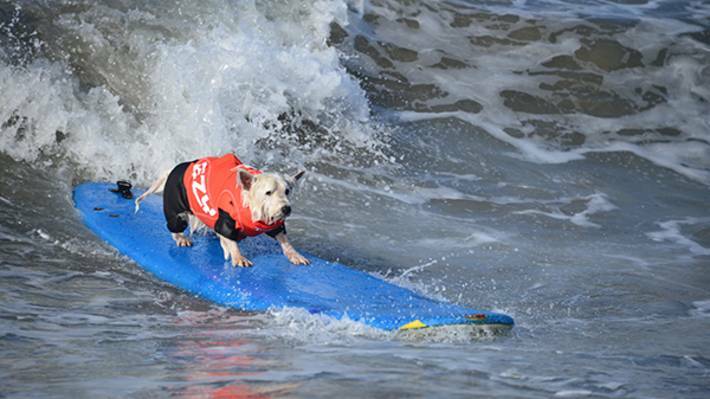 3) Who are your main competitors for the upcoming Surf City Surf Dog? Well, there is that cute girl from San Diego, Gidget the pug, and my pal Logan the Frenchie. 4) Tell us about your rigorous training schedule leading up to Surf City Surf Dog. I go out with my coach every week. We practice, and he gives me pointers on handling the board, balancing my weight, and my personal favorite—riding the nose without pearling! I get really stoked when I hang 20 and surf the foam to shore. 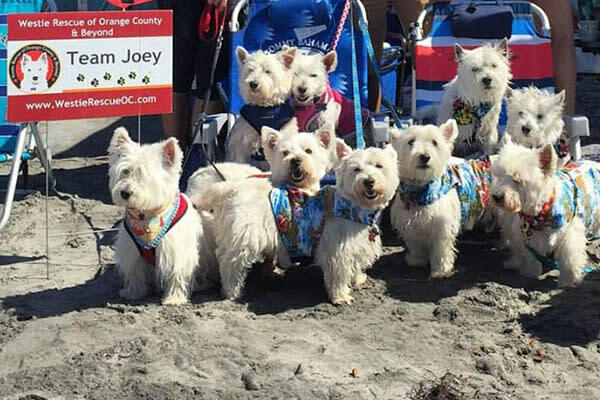 5) Do you think being a Westie Rescue of Orange County & Beyond dog gives you an edge over the competition? Absolutely! Rescue dogs are survivors! My life was rough before I was rescued. Living on the streets made me tough. I always knew I was born to do great things. I was born to make waves! 6) Kay, how will you support Joey in and out of the water on September 23? The most important thing to our team is to keep Joey safe and to have fun. It’s a family affair. My husband Dan is our WROC photographer, my daughter-in-law Andrea is in the water with Joey, and my son Doug and I are catchers. In 2006, Kay stumbled upon Joey, a West Highland White Terrier, in a high-kill shelter. After five trips to the shelter, she rescued Joey and brought him to his forever home. 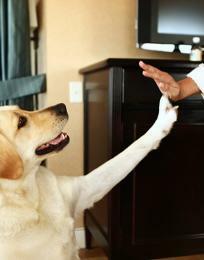 He learned obedience training with ease and had a very calming effect on nervous rescue dogs. 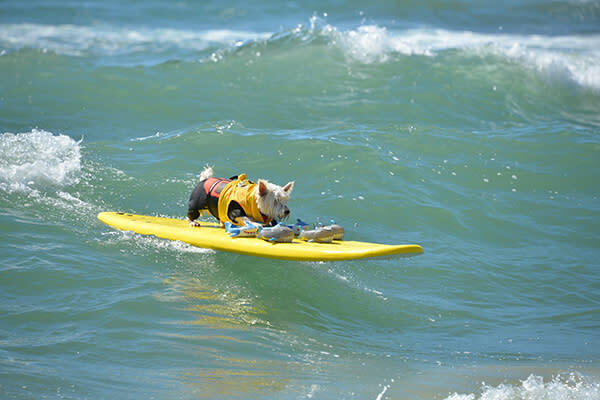 And, of course, let’s not forget his surf skills, which have earned him finals spots in the Surf Dog Events small dog category every year, along with “Best Novice” in 2010, first place in 2012, and second place and “Most Spectacular Wipeout” in 2014. Nowadays, at age 12, Joey leads the pack as WROC’s logo model and makes public appearances at schools and events to educate children on the importance of properly caring for their pets. Following Saturday’s competition, the NY Dog Film Festival will screen a special double feature on Pacific City’s outdoor movie screen from 6-9 p.m. Tickets cost $25 and are available via Eventbrite. 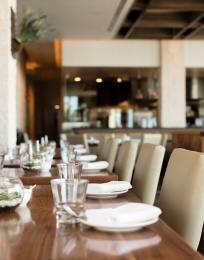 A portion of the proceeds benefit OC Shelter Partners. SCSD wraps up on Sunday, September 24, with an “SUP With Your Pup Meetup” at Pirate Coast Paddle Company in Newport Beach from 11 a.m.-1 p.m. Those sporting their own equipment can join the fun for free, and those in need of gear can score a special $20 per hour Surf Dog rental rate. Surf’s up, dogs and dog lovers!